It was commonly said to young women by older family members, who believed that being married was the most important aspect of a woman’s life. Taken literally, it means that being a woman with a man, is better than being a woman on her own in an empty house sitting by the wall. Back in the day, Arab societies considered divorce as the worst-case scenario and a terrible option for a couple. The idea that a man and woman should officially separate their lives was never acceptable. Socially, a divorced couple had a strong sense of taboo hanging over them. In both Islam and Christianity, divorce is known as a concept hated by God. It is even forbidden by most of the eastern churches as well. So if you are a Coptic Christian in Egypt, you have an even more difficult time to file for a divorce. But today, the perception of divorce has slowly gone from extremely negative to slightly neutral. As the cultural taboo of divorce has gone down, Arab countries are facing a dramatic spike in divorce rates, and new rituals are being adopted. According to William Doherty, a marriage therapist and professor of family social science at University of Minnesota, most divorces are initiated by women, because of the changes in women’s expectations to what a “good life” is. Women today generally expect an equal partner, who will carry the weight of marriage with her; someone who will support her pursuit of a career as well as the pursuit of motherhood. But in many cases, men become very dependent on the woman, and that was not the intention going into the marriage. In the Arab world, a country with one of the highest divorce rates is Egypt: On average, a divorce case is being recorded every 4 minutes in the country’s courts. A 2018 report issued by the Egyptian Central Agency for Public Mobilization and Statistics shows divorce cases in the country rose to 18,600 in August, from 18,100 at the same month the year before. The statistics confirm the existence of more than 4 million divorced women, and family courts face long daily queues of married women willing to make the difficult decision of leaving their husbands. Yasmeen, 37, a Egyptian (from Alexandria), got divorced recently. Talking to Gulf News, she said her marriage lasted for 6 years. But it didn’t let her feel secure. Yasmeen said she understands why many Egyptian women are getting divorced, now more than ever. From her conversations with friends and family, she figured out what the problem is. “We are strong women, we take the lead, and we marry men who are not being responsible. Women’s rights have ruined our eco-system, we wanted equal rights, but we only got extra burdens. No one taught our men to share the burdens of a family equally,” she told Gulf News. Dr Monica de Sousa Mendes, a Dubai-based psychologist practising for 16 years, explained reasons behind the high divorce rates. As divorce rates are skyrocketing, women have recently started the trend of celebrating divorce to savour their freedom. To them it is not perceived as a failed marriage; rather, it is now seen as a successful exit from an unhappy marriage. Couples between the age of 29 and 36 see the highest divorce rates in this region, according to Dr Mendes. Sawsan, 33, married for three years, decided to throw herself a party once her divorce papers were signed. She invited all of her best friends over, had catering, cake, juices and music. It was a happy occasion. Instead of a cake that said ‘Happy Birthday’ or ‘Happy Anniversary’, this cake said ‘Just Divorced’ in bright pink icing. 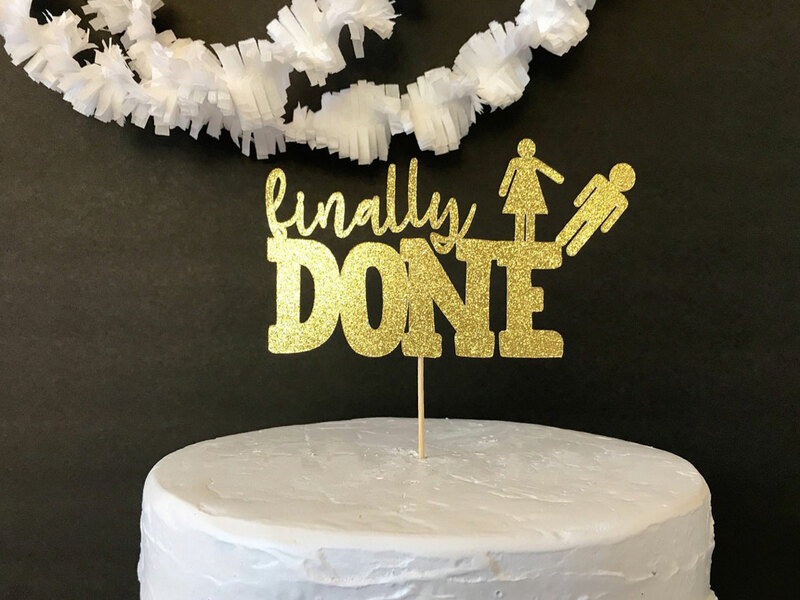 Divorce parties are taking the shape of weddings from invitation cards, to hotel ballrooms, fancy dress for the divorcee and even a 3D cake specially done for the occasion. In Mauritania, divorce parties are old and part of the culture, where women would throw a party at her home, three months after finalising the divorce. She would dress up, put henna and dance with her friends all night. Modern divorce parties have started in Japan with an event planner called Hiroki Terai, who now only plans divorce parties or ceremonies, in a special “divorce mansion” he found in Tokyo. Even celebrities have embraced the trend. Lebanese singer Maysam Nahas, Egyptian actress Hana Sheeha and the Syrian Joumana Hadad have celebrated their divorces by having big parties where many celebrities were invited. In Egypt, many people are still finding the idea of a divorce party weird and a tad un-classy. Especially since divorce is still somewhat perceived as a failure and a collapse of a relationship. So what exactly are these women celebrating? Some people think it’s an unnecessary display of a relationship status. So… is divorce a good solution? Dr Mendes said divorce is better than staying in a bad marriage. Moreover, she said, divorce isn’t the worst thing that can happen to the kids: Enduring a horrible home life is. Of course, divorce should rarely be the first choice because, generally, the only thing keeping a “bad” marriage from being a “good” marriage is sustained mutual effort. That being said, there are times that divorce is the best choice to allow both partners to grow and achieve the life they desire, and in some scenarios, the life they deserve. For some people, divorce is a profound life change in terms of security, and the adjustment to it may lead to depression and severe anxiety. For others, it is a relief from fear and inertia and a new life opportunity.